This is now the third dealership we know of that has jumped on the public’s love affair with retro-looking Chevrolet Silverados. Valley Chevrolet, located in Pennsylvania, has begun transforming 2018 Chevrolet Silverado 1500 models into modern-day Cheyenne Super 10 trucks. 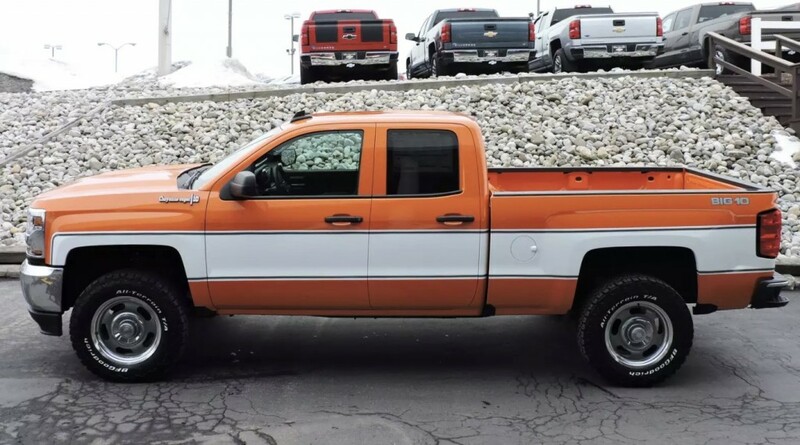 Valley Chevrolet follows Blake Greenfield Chevrolet in Minnesota and John Elway Chevrolet in Colorado with its own throwback pickups. The PA-based dealer says it will turn any Silverado on its lot into a Super 10 with a 3.5-inch lift, 18-inch wheels with BF Goodrich white lettered tires (of course), “Big 10” decals and a two-tone decal package. Thus far, the dealer has built three of the pickups, but two have already sold, leaving the orange one as the only pickup ready for sale. The dealer’s website has already teased its next Big 10 conversion. There’s no doubt the pickups and their 1970s garb look quite good, and we especially like the black, white and red conversion Valley Chevrolet offered. The pickups are probably pulling in healthy profit margins for these dealers, too. Frankly, we think it’s shocking General Motors hasn’t jumped onboard with its own retro package, though we do have an inkling that the “Cheyenne” name may be returning for the 2019 Chevrolet Silverado. Wow those Chevys are beautiful ! I wonder what the extra cost is ? I really like em too. Would also like to know what the up charge is. Is the white painted on or is it a decal? I wish one of these dealers would do a regular cab, I’d love to see of those done up like this ! I just wonder how well it would have been received if this was a factory option? My guess, not so much. GM probably would have been poked at for trying to relive the past. We’ll never know! GM sold 948,909 full size/mid-size trucks last year, had they been a little more aggressive in advertising and or promotion’s (or offered a throwback) they could have hit the 7 figure. I know it’s not always about the sales numbers, but with the new full size models coming later this year. They need to move the current trucks off the lot’s. It could have been a clever marketing campaign and a great target for dealerships to try and repeat! I would love to see Chevrolet do something like this from the factory because that first truck looks awesome. I wish they would do this and a black out SS package like the early 90’s SS-454 trucks had. I hope GM is really paying attention to this!! !